The scientific goals and rationale for RAID were developed at a series of community meetings and workshops beginning in 2011. Drill a 2500 to 3300 m borehole to the base of the Antarctic ice sheet as rapidly as possible. Drill through dry, frozen-bed conditions in the absence of liquid water at the basal glacial bed (ice- rock interface). 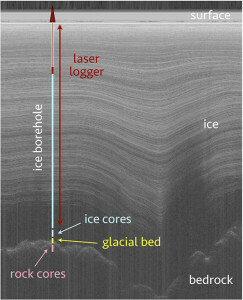 Retrieve short ice cores (~50 cm long) of approximately 1.5”-1.875” inches diameter at up to 2500 m depths. Retrieve 25-50 m of bedrock cores of approximately 1.5”-1.875” inches diameter at up to 2500 m depths. Design a drilling rig that will fit on a skid-mounted mobile platform and be deployed as part of a stand-alone, traverse-capable system. Construct boreholes that will remain open for down-hole logging for up to 5 years. Produce 3300 m (10,800 ft) borehole to base of ice in 200 hours of drilling operation, including setup, drilling, and retrieval of ice, sediment, and rock core (as specified below). Minimize borehole fluid volume and rod weight requirements by drilling a borehole with a diameter less than 3.25 inches, and make the diameter uniform throughout its depth. Drilling will be done through dry, frozen-bed conditions without liquid water at ice-rock interface. 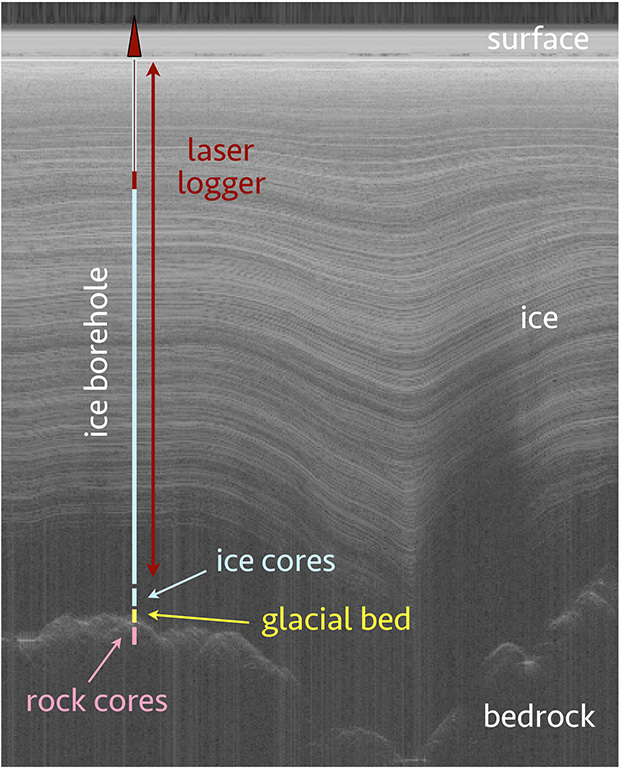 Retrieve short ice cores (~50 cm long) of 1.4 inches diameter (BQ size) at up to 3300 m depths. Retrieve 25-50 m of bedrock cores of 1.4 inches diameter (BQ size) at up to 3300 m depths. The drilling system will be equipped with drilling-fluid recirculation, ice-chip separation, ice-chip disposal, and fire suppression systems. Drilling rig is to be deployed on stand-alone, traverse-capable, over-ice system (to be provided separately as sleds or air pontoons to support rig on snow surface). Design the RAID system for operation with a minimal drilling staff, but with an objective of maintaining 24/7 operations. Ice boreholes must remain open for scientific ice-logging purposes for up to 5 years with pressure-compensating fluid, allowing for some deformation and/or decrease in diameter. Borehole walls should be left clean for optical logging (to follow). Drilling fluid will consist of a non-freezing, non-ice-reactive (“hydrophobic”) fluid having a density similar to water ice (0.917 g/cm3) and able to provide approximate hydrostatic pressure compensation at maximum borehole depth. The planned drilling fluid is ESTISOL 140. The drilling fluid should be transparent and have a refractive index similar to that of water ice, to permit optical ice-borehole logging. These properties are also consistent with ESTISOL 140. The drill rig should fit on a platform suitable for truck and sled transport. Other components should fit standard ISO container dimensions. Anticipated weight limit for any single component is 48,000 pounds. Provision should be made for self-leveling in case of surface settling. The drilling rig and all components must be capable of operating at high elevation (up to 4,000 m or 13,000 ft AMSL) and cold air temperature (down to -40°C or -40°F). Borehole ice temperature may be as low as -55°C or -67°F. Drilling should produce a borehole that deviates less than 10 degrees from vertical.